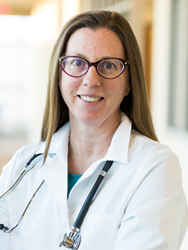 Dr. Karen Finkelstein, M.D., of Southwest Gynecologic Oncology is the first to earn two Surgeon of Excellence designations in the state of New Mexico. In recognition of her unparalleled commitment to deliver the safest, highest quality of care, Dr. Finkelstein earned recognition in both Robotic Surgery and in Minimally Invasive Gynecology—making her the first women’s specialist in New Mexico to receive both certifications. A double board-certified OB/GYN and GYN/ONC, she also leads an experienced care team at Southwest Gynecologic Oncology, a private practice offering leading-edge treatment for gynecologic cancers in New Mexico. The practice receives patient referrals from primary healthcare physicians, OB/GYNs, nurse practitioners and other women’s healthcare providers who are in need of a gynecologic oncology specialist who treats women with difficult diagnoses. Dr. Finkelstein has made it her mission to become a champion for the treatment of gynecologic cancers by continuing to strive for the improvement of cancer care. In addition to her position at the private practice, Dr. Finkelstein has also been appointed as the Medical Co-Director of the Center of Excellence in Minimally Invasive Gynecology (COEMIG) program at Lovelace Women’s Hospital, an accreditation the hospital received in February of 2017. The hospital was also designated as a Center of Excellence in Robotic Surgery (COERS) in December 2016. Both accreditations were recognized by the Surgical Review Corporation, an international accrediting institution. The hospital’s designations are the first to be achieved in the state of New Mexico. Additionally, Southwest Gynecologic Oncology actively participates in promising cancer and pharmaceutical clinical trials through its association with New Mexico Cancer Care Alliance, where Dr. Finkelstein also serves as an executive board member. To learn more about Southwest Gynecologic Oncology and its three locations, visit swgynonc.com. About Southwest Gynecologic Oncology Associates, Inc.
For more than three decades Southwest Gynecologic Oncology Associates, Inc. has been a leader in women’s oncology care in New Mexico. The private medical practice provides personalized and concierge level care which includes the management of state-of-the-art cancer care in all aspects of gynecologic cancer including radical surgery, chemotherapy, radiation therapy, genetic counseling and minimally invasive surgery and the DaVinci robotic surgery system.